97 Saturday August 21st 1875. Winnie and I went to town real early and I attended to ever and ever so many errands. I got another bird that will be company for Harry it belongs to Aunt Mary. It was eleven oclock when we got home. Hattie had the house cleaned up and in the afternoon I did the baking and Hatties ironing for her as she and Winnie were in the valley with Jim Anderson. After we got the work done up Mrs W_ Lee and myself walked over to the depot thinking Mr Winter would come but he did not. I was very tired when we got home and went right to bed. 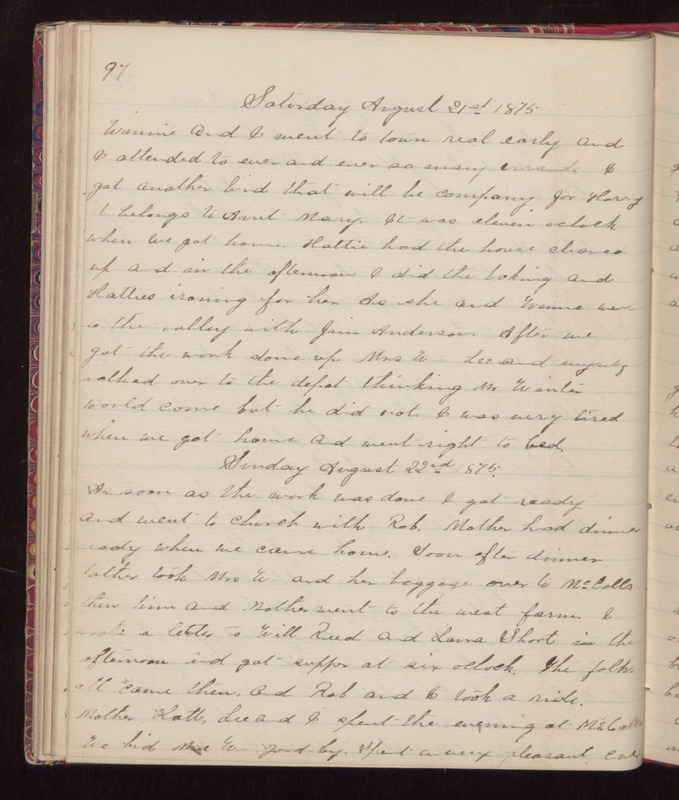 Sunday August 22nd 1875. As soon as the work was done I got ready and went to church with Rob. Mother had dinner ready when we came home. Soon after dinner Father took Mrs W_ and her baggage over to McCalls then him and Mother went to the west farm. I wrote a letter to Will Reed and Laura Short in the afternoon and got supper at six oclock. The folks all came then, and Rob and I took a ride. Mother, Hatt, Lee and I spent the evening at McCalls. We bid Mrs W_ good-by. Spent a very pleasant eve.